On this day in 2009 Nick Swisher was brought in as a relief pitcher throwing 22 pitches and allowing one hit and surrendering one walk in an inning of work. Swisher also struck out Gabe Kapler on a swinging strikeout and retired three consecutive batters to become the first positional player to pitch for the Yankees since Wade Boggs did it in 1997. Swisher volunteered to pitch an inning to save the bullpen in a 15-5 loss at Tampa Bay after Yankees starter Chien-Ming Wang only lasted one inning. 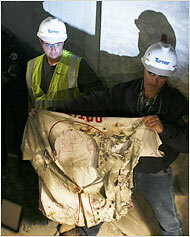 Also on this day in 2008 construction workers at the new Yankee Stadium dug up a tattered David Ortiz Boston Red Sox jersey in the concrete of the new ballpark. The jersey was auctioned off to raise money for the Jimmy Fund. The New York construction worker, obviously a Boston fan, put it there hoping to put a curse on the new stadium. Also on this day in 2005 a near by pedestrian saved the life of eight year old Patrick McCarthy by preventing him from walking out into a Boston road and getting hit by a truck. The hero who prevented the accident put his arm out and said "Whoa, watch out buddy" and caught the boys attention since he was his favorite baseball player, Alex Rodriguez. Also on this day in 1998 a beam fell at Yankee Stadium and forced two Yankees home games to be postponed and one to be played at the New York Mets Shea Stadium. Also on this day in 1978 Roger Maris returned to Yankee Stadium for the first time since the team traded him to the St. Louis Cardinals in 1966. Maris came back to help former teammate Mickey Mantle hoist the World Series flag after a promise was made to Maris by Yankees owner George Steinbrenner to install sod and lights at a baseball field at Maris' children's school in Gainesville, Florida. Also on this day in 1978 Reggie Jackson hit a home run in the first at bat of his season at Yankee Stadium. This is important because Reggie's final three at bats at Yankee Stadium in 1977 were home runs making this a fourth consecutive Yankee Stadium home run for Mr. October. Also on this day in 1962 the Detroit Tigers pitcher Frank Lary pulled a muscle in his leg running out a triple, which he overcompensated with in his arm and ultimately injured himself and ended his career. This is Yankees news because Lary was always known as one of the original "Yankee Killers." Finally on this day in 1939 Lou Gehrig, with apparent muscle loss around his shoulders, hit two home runs in an exhibition game against the Dodgers. These two home runs will be the last that the "Iron Horse" would ever hit in his major league career. And Let the 2019 Free Agency Rumors Begin!